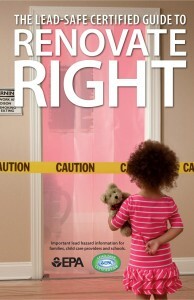 Renovate Right: Important Lead Hazard Information for Families, Child Care Providers, and Schools – April 2010 (PDF) – General information about legal requirements for safe lead practices for homeowners, tenants, child care providers and parents during renovation activities. Renovate Right: Important Lead Hazard Information for Families, Child Care Providers, and Schools – April 2010 (PDF) (Spanish Version) – General information about legal requirements for safe lead practices for homeowners, tenants, child care providers and parents during renovation activities. 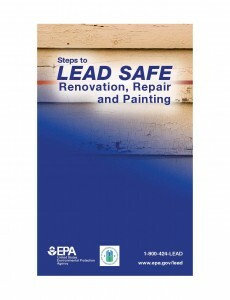 Steps to Lead Safe Renovation, Repair and Painting (PDF) (36 pp, 878K). 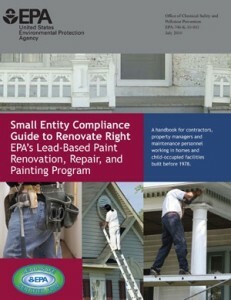 Thirty-six page guide with information for contractors and homeowners on how to plan for and complete a home renovation, repair or painting project in pre-1978 housing and child-occupied facilities using lead-safe work practices.